There are few things that make me feel quite as good as crossing a bunch of things off my internal to-do list. Today, I cleaned a house, dropped at Walmart for a few things I forgot during my massive grocery shopping and Steve needed new windshield wipers desperately, especially with this crazy weather coming. Then I stopped at the bank to cash the housecleaning check, and went to town on our home. I finally removed all of the Christmas decorations and took down the tree. I lovingly combed all of the tinsel off each branch and tossed it in the trash, pondering the whole time why I can't just put the tinseled tree back in the box as is, since I'm just going to put more tinsel on it next year. I came to the conclusion that it's to help employ the people at the tinsel factory. Then I went to work on bleaching. I bleached the sink in the kitchen, the bathtub and sink in the big bathroom, and the floor in the little bathroom. I cleaned the rest of the house, vacuumed meticulously, took a shower, and lit about ten candles to burn off the bleach scent in the house, then started making dinner. At the same time, I did laundry, and made pudding desserts in wine glasses with whipped cream and shaved chocolate on top. *This* is what I would do if I didn't have to work all day long. Well, this and writing, of course. There's something to be said about this incredible sense of accomplishment. Sometime last year, or the year before, I thought I'd take Thursdays off for a 'mental health day' so I could do just this sort of thing. It turned into a housecleaning day, grocery shopping day, random errand day, and it seemed never to get off the ground as a day I could really get the house cleaned up and put a nice dinner on the table. Today is what I was hoping every Thursday could be, and I'm not getting my hopes up for that this coming year, but it was nice to have it at least once! So, let's talk about the inevitable. Winter. Yeah, it's finally here, and with a vengeance. We're supposed to get 8-12 inches of snow tonight. I'm hoping it clears up by Saturday morning and that the roads are clear, else it's going to sincerely put a damper on my weekend. Winter is not my favorite. 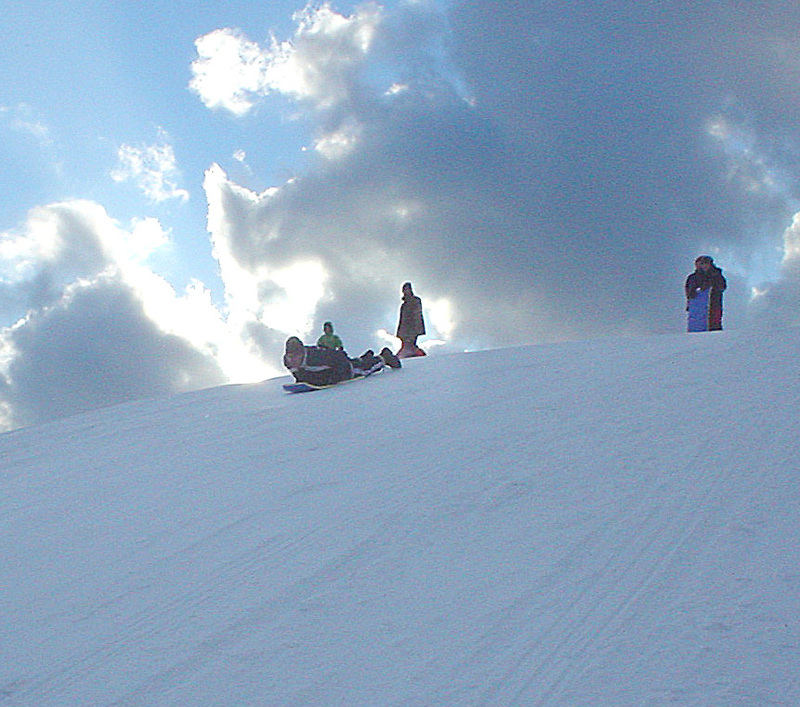 I do like sledding, and we didn't get a chance to do so last year, but I want to get out there and do some this year. Something about sitting down on a saucer and letting go, the adrenaline rush I get on the way down -- it's not like being in a roller coaster or behind the wheel of a car where I'm putting my faith in machinery not to fail. It's me, on a plate, in the air, down a hill. I love it. It reminds me of what life is really like. I can plan and plan, I can decide to do something, I can search out the right path, I can bundle up against the elements, but in the end it's me throwing everything up in the air to God and saying, "It's all you, Man. I'll see you at the end of the hill!" Plus, it's really fun to walk up behind one of the kids while they're debating whether or not to go down the hill and push them. Heh. Yeah, I'm that kind of mom. Do not ever, ever, ever go sledding with Stephanie; She pushes people downhill. "but in the end it's me throwing everything up"
Fifty For the New Year!